OLLY Protein Powder is a protein supplement based on pea protein and flaxseed, containing 18g of protein per serving and with each shake totalling 180 calories. Claiming to keep your body strong and energized throughout the day, we uncover whether it can live up to these statements. We uncover the ingredients and whether it can target weight loss, including what side effects and results you might experience. Would we recommend it? Read on to find out. No comments Published Mar 24, 2019. OLLY Protein Powder is a plant-based protein powder that according to the advertising will “keep your energy up and your hangry down”. If you are on a health kick of weight loss and exercise, it looks as if it may help. Let’s take a look. OLLY is a supplements company based in the USA, possibly in California. There are no direct contact details such as phone line or physical address, but the company has a presence on Facebook and Instagram and products are on sale from a choice of outlets in the USA. OLLY Protein Powder is a straightforward protein supplement based on pea protein and flaxseed. Essentially, it is the same as the other OLLY shake – OLLY Slim Protein Powder (also called Slim Boost), but without the added weight loss extras of chlorella and a prebiotic formula. That said OLLY Protein Powder looks a little better. The flavours seem to be more palatable and it is less expensive too. 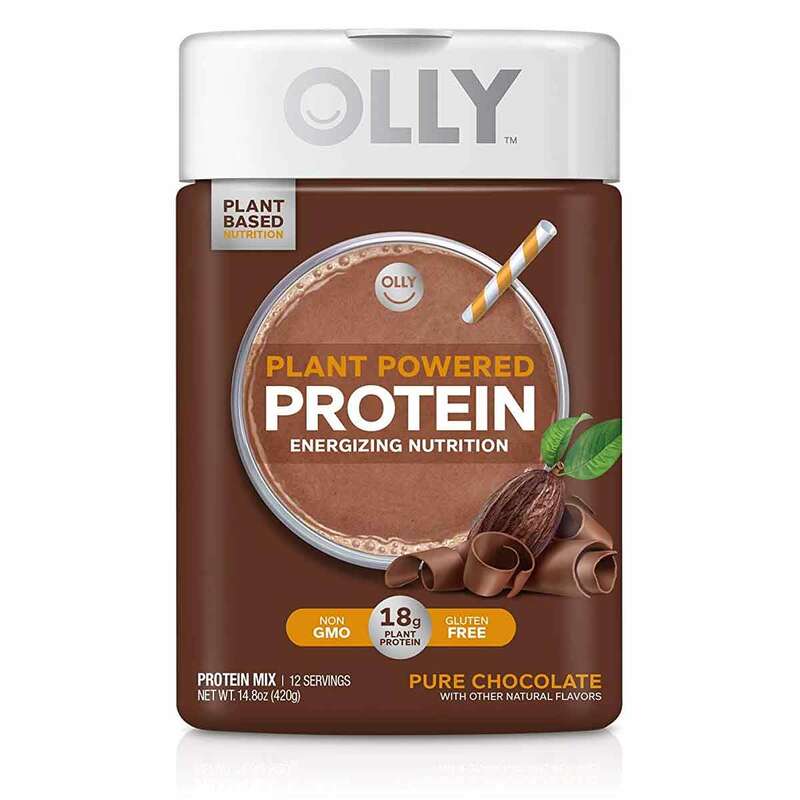 OLLY Protein Powder comes in two flavours; Pure Chocolate or Velvet Vanilla, and each container provides enough for 12 servings. Customers have not mentioned any weight loss benefits, but you may find it helps you avoid more fattening snacks if you use it to curb your appetite. What are the side effects of OLLY Protein Powder? Protein powders can cause mild side effects including gas, bloating, upset stomach, and thirst. How much does OLLY Protein Powder cost? OLLY Protein Powder is quite expensive. Buy from the official OLLY website and it costs $19.99 per 420g tub. Each tub is enough for 12 servings. You choose your flavour at the point of sale. You can also sign up to auto-ship on a monthly basis. There seems to be little point in doing this because the auto-ship price does not offer a discount. However, there is a discount if you subscribe quarterly on the company’s auto-ship option because this gets you 3 x tubs for $50.97. OLLY ship within the USA only. Shipping charges are not provided, although it is free on orders over $50.00. Shipping to Alaska and Hawaii takes around 6 weeks. 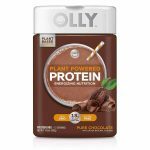 You can also buy OLLY Protein Powder via Amazon where it costs $18.99 for auto-ship, and $19.99 as a one-off purchase. Orders are fulfilled by Amazon. OLLY Protein Powder is a powdered drinks supplement that is available in a choice of two flavours; Pure Chocolate or Velvet Vanilla. You just add the powder to water or your favourite beverage, shake it up, and drink. You can also add the protein powder to cooking, making cupcakes, brownies, and similar. OLLY Protein Powder contains 18g of protein per two scoops serving. The protein is provided by flaxseed and pea protein, and the shake is vegan-friendly and does not contain GMO, gluten, or dairy either. In fact, apart from the protein content and the flavourings, there is nothing much else in it. Check out the ingredients tab to find out more. At first glance, OLLY Protein looks pretty much identical to OLLY Slim Protein Powder (also called Slim Boost). The protein content is identical but unlike OLLY Protein Powder, Slim Boost contains additional weight loss ingredients so is aimed at weight loss. This supplement, OLLY Protein Powder is not actually marketed for weight loss, but in truth, there is not much difference between the two supplements. We covered OLLY Slim Protein Powder in a previous review. We have also reviewed other OLLY supplements including OLLY Endless Energy, a gummy sweet, and OLLY Probiotic + Prebiotic, a chewable supplement. OLLY is a youthful fun company, according to the “about us” information. The supplement range is all about inner health and wellness, and the company is fully engaged on social media. OLLY supplements are on sale from retailers including Walgreens, Safeway, and Amazon, as well as the official website. There are no real contact details for OLLY such as phone line or physical address. This is not so important because the company sells from a range of outlets and not just from the official website. What does OLLY Protein Powder claim to do? “Get your plant based protein and drink it too with OLLY Protein Powders. 18g of high quality plant protein per serving helps keep your body strong and energized for whatever your day throws at you, or wherever it takes you. Does OLLY Protein Powder work? It all depends upon what you are expecting it to do! You may find that it is a handy way of filling you up in between meals and if you usually turn to chocolate bars as a snack, this shake will probably feel more filling and give you far more bang for your buck when it comes to the calorie count. The product information claims that the shake will help you feel energized. It might do that because it is hard to feel good if you are struggling with hunger pangs. However, there is nothing in particular that shouts “weight loss” about this shake. If you add it to your diet without cutting out something, you will put on weight and not lose it. Each 2 scoop serving (35g) contains the following ingredients profile. Total Sugars: 6g. This is made up of 6g of added sugar. Protein blend (18g): This is composed of flaxseed and pea protein. Pea protein is free from cholesterol, gluten, and dairy ingredients, and is a highly effective source of amino acids that actually contains more protein per weight than whey protein. It can help reduce cholesterol levels and boost heart health, as well as help weight loss. Pea protein is rich in nutrients and makes you feel fuller for longer after taking. Pea protein seems to lower ghrelin levels, the hormone located in your stomach that signals hunger. Vitamin D (0mcg): There seems to be no point at all in adding vitamin D to the ingredients list when it does not contain any vitamin D.
Calcium (75mg): Mineral which is essential for healthy bones and teeth, as well as blood the nervous system and more. Supplements can be taken for a range of issues including thinning bones, as an antacid, and more. Serving size here is equal to 6% RDA. Iron (2.5mg): Iron is a mineral that is very important for healthy blood cells. Most people obtain sufficient iron from their diet, but vegetarians and vegans may need to supplement because much is obtained from meat. Iron deficiency can lead to anaemia. The RDA is around 15mg of iron a day so here at 15% of RDA. Potassium (180mg): Important mineral for many bodily functions including blood pressure. Here at 4% of RDA. Other Ingredients: Natural cane sugar, cocoa powder, natural flavours, salt xanthan gum, monk fruit extract, Stevia. There are customer reviews for OLLY Protein Powder. I add a frozen banana and it is satisfying. I am good till dinner. I really like the taste of this and when I add coconut milk and a banana it is absolutely yummy! Honestly delicious. I wasn’t expecting much because, you know, meal replacement drinks are gross and all but not this one. Mix in blender with vanilla unsweetened almond milk and add a few ice cubes. Soooo good. Skipping, or sipping a meal never tasted so good. Taste and texture, good, but didn’t agree with my stomach. It must be mixed with in a blender with fruit to be even remotely palatable. Very unpleasant on its own. Will not buy again. Nobody has mentioned any weight loss results from using this supplement. You can buy OLLY Protein Powder directly from the OLLY website. It is also on sale in some stores across the USA including Target and Walgreens, and it is also available from many online retailers including Amazon. OLLY Protein Powder is OK. Like all protein powders, it will come down to whether you like the flavours and how you use it. If you use this to replace food that is more fattening and less filling, OLLY Protein powder may help you lose some weight. But if you use on top of your usual diet, you will probably put weight on. Good points about OLLY Protein Powder are that side effects are unlikely, and we like that it is guaranteed GMO-free. Not so good is that there is no money-back guarantee and that each tub contains only 12 servings which seems very inconvenient. There is some good customer feedback too and although nobody has actually mentioned weight loss, some people find that using this is an enjoyable experience. In our opinion, OLLY Protein powder looks alright and is better than the similarly named OLLY Slim Protein Powder but is still not good enough for us to recommend to the Watchdog readers. How does OLLY Protein Powder compare to Phentaslim?